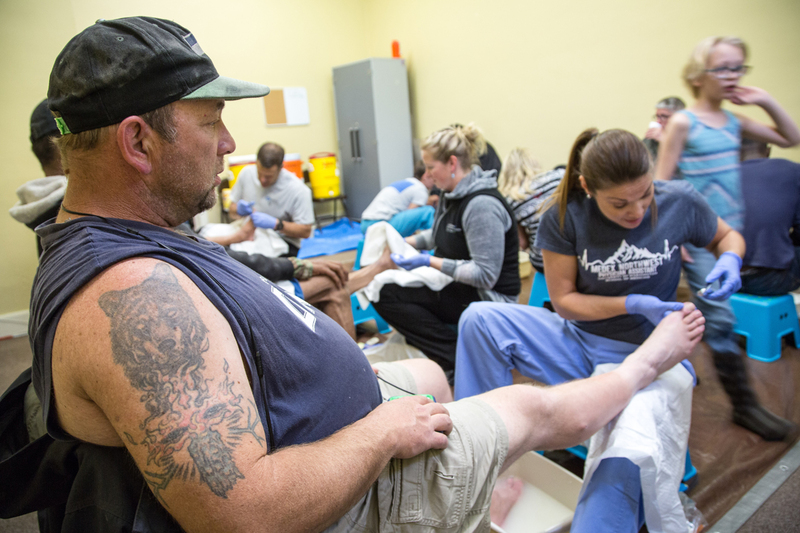 Aimee Edmunds of MEDEX Tacoma Class 3 works with a client at the Foot Clinic. Depending on their situation some clients might walk between five and eight miles a day, and their feet show the stress. 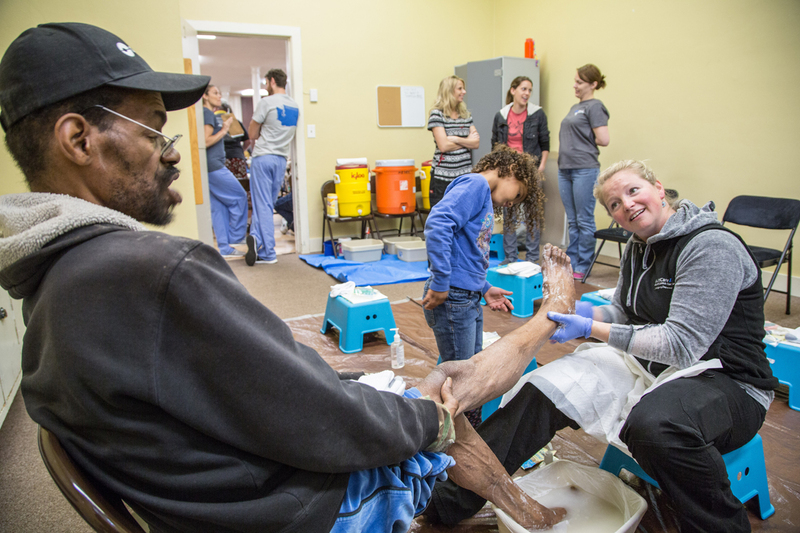 Amanda Brown of MEDEX Tacoma Class 3 washes the feet of a client from the Urban Grace Church community breakfast. 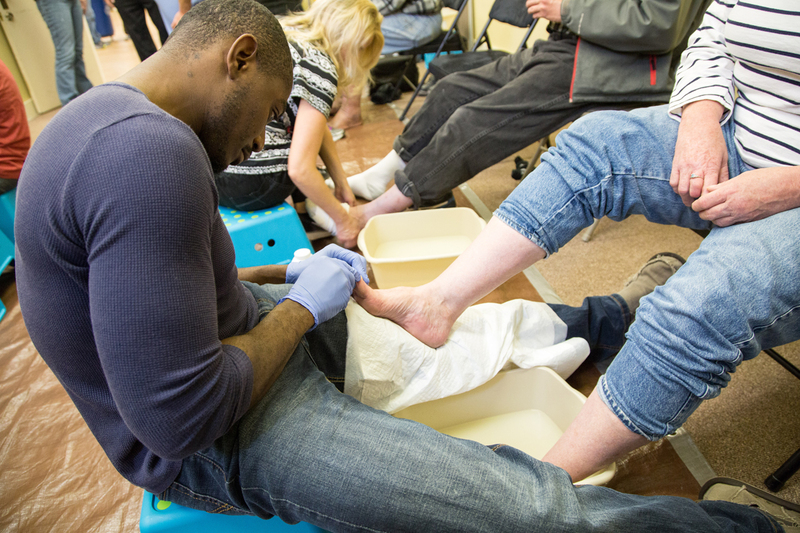 MEDEX student Frantz Alphonse carefully inspects the feet of a client at the Tacoma Foot Clinic. Frantz came to the MEDEX PA program after years as a US Navy Corpsman. Frantz Alphonse of MEDEX Tacoma Class 3 (right) works with a gentleman who dropped in from the Urban Grace Church community breakfast. MEDEX student Frantz Alphonse works to clean and repair the client's nails. Doug Aguirre, a member of MEDEX Tacoma Class 3, works with an elderly gentleman who is both diabetic and blind. The makeshift foot clinic is full up. 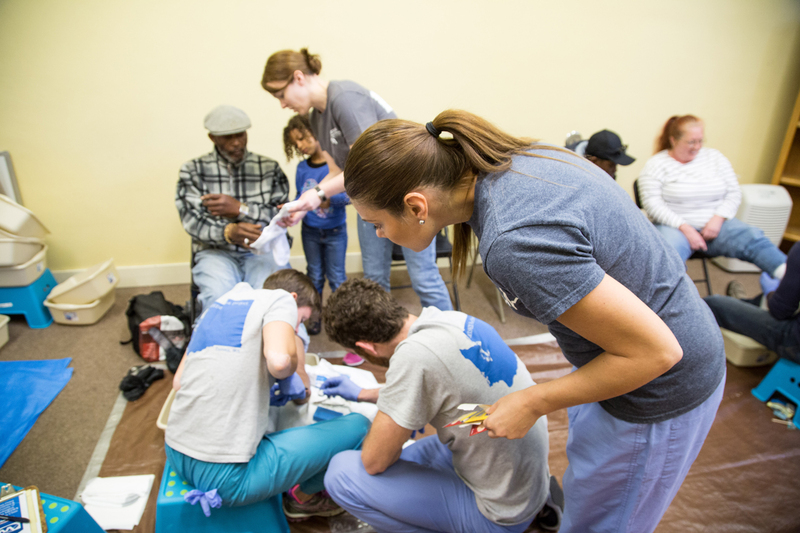 Once a month MEDEX physician assistant students volunteer their time to care for the feet of the homeless and poor in Tacoma. Kate Osborne, PA-C and alumni of MEDEX Tacoma Class 1, was one of the founding members of the Tacoma Foot Clinic. 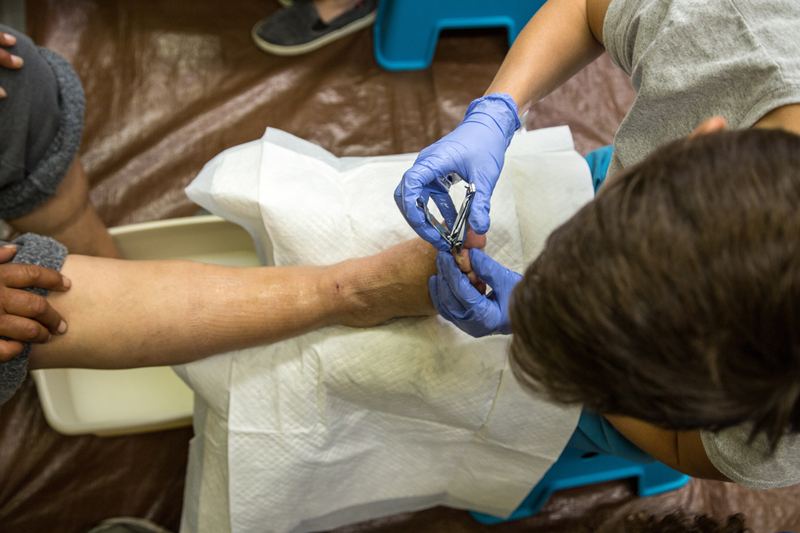 Kate Osborne, PA-C, trims the toenails of a client from the Foot Clinic, and instructs him in proper self care. Individuals who show at the Urban Grace Church community breakfast are split between the actively homeless or those that are more food insecure. 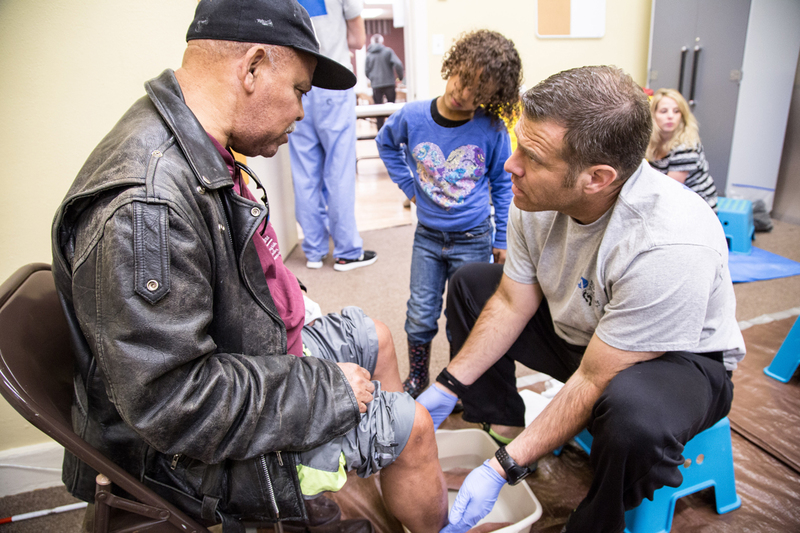 The Foot Clinic represents a partnership between the church and the MEDEX Northwest Tacoma site. 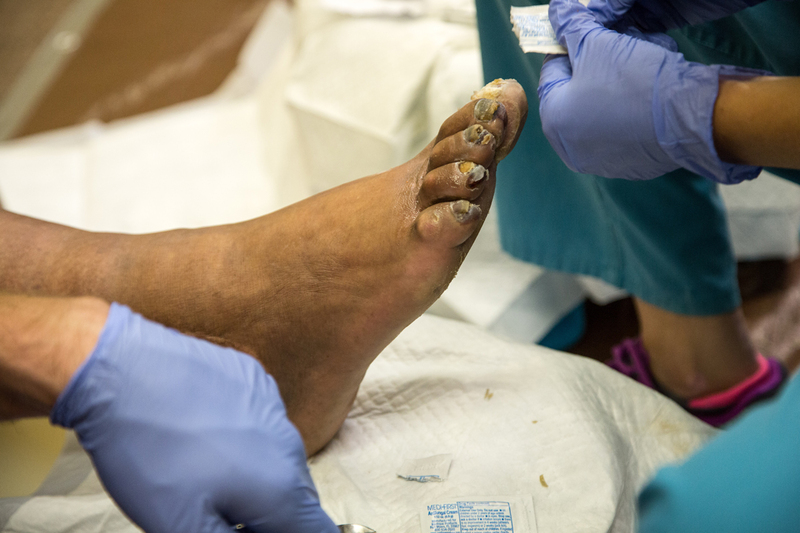 After treatment at the Foot Clinic, each client receives a clean pair of socks. 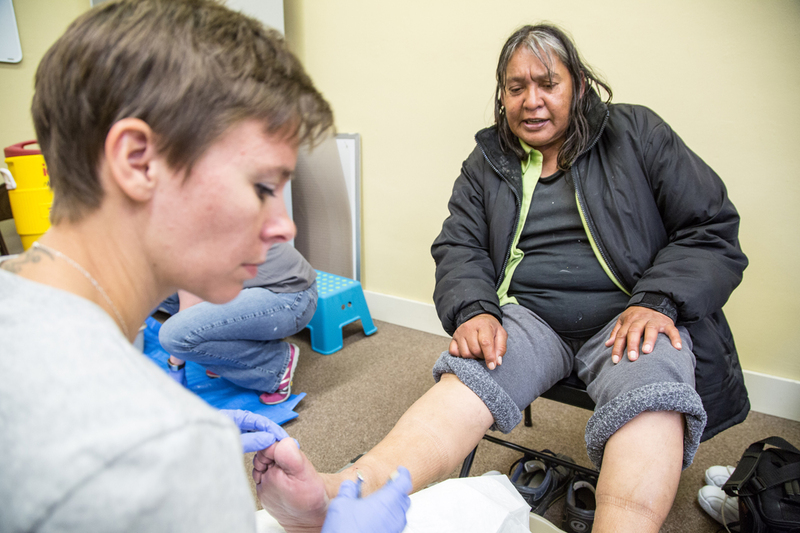 Missy Griffith and Aimee Edmunds, both students of MEDEX Tacoma Class 3, work with two women who have arrived at the Foot Clinic. 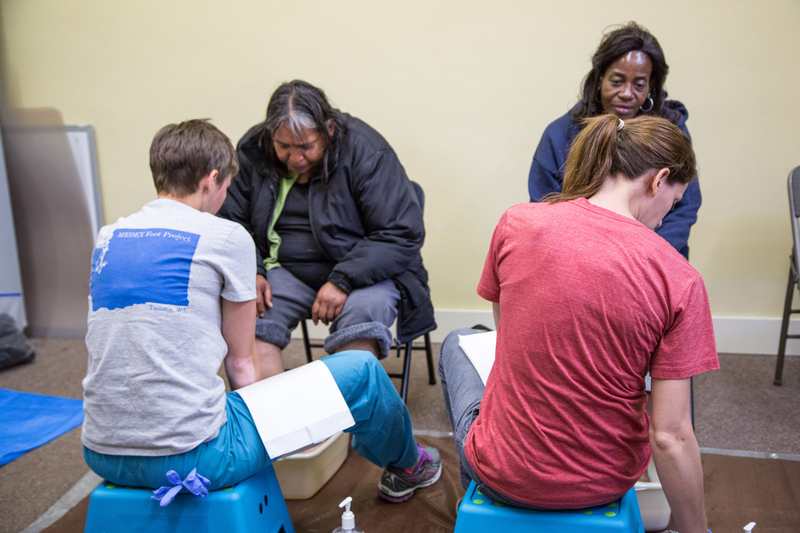 Missy Griffith, a former paramedic prior to MEDEX, trims the toenails of a female client. 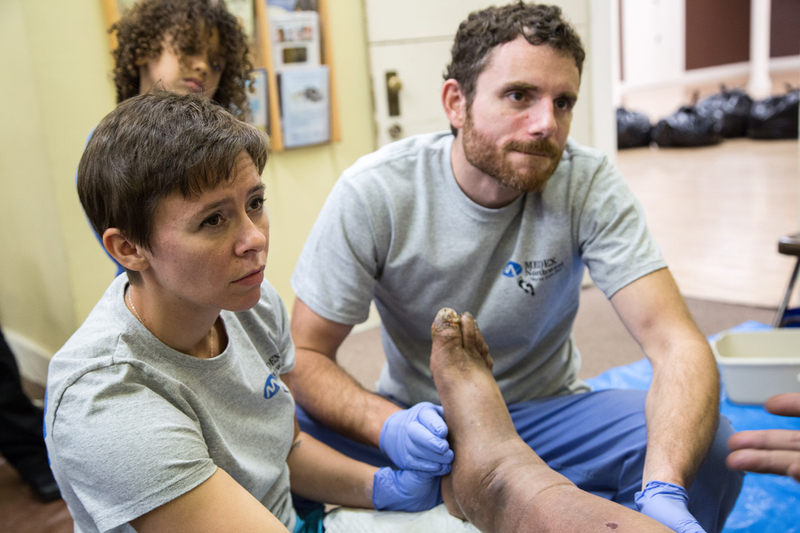 Missy Griffith has taken on a leadership role with the Foot Clinic for her Tacoma Class 3. 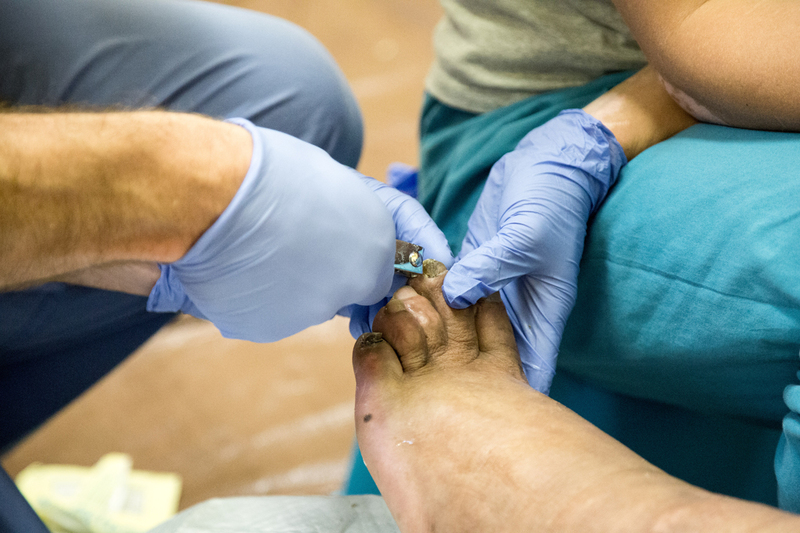 One of the benefits of the Foot Clinic is that clients are treated with dignity and care. 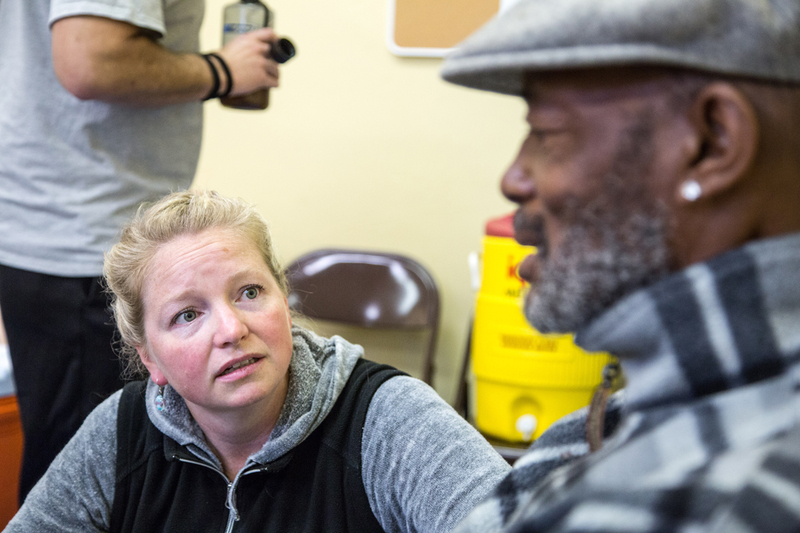 It’s an opportunity to connect for a population that’s often marginalized and pushed aside. This client revealed that she's had multiple foot and ankle surgeries over her lifetime in an effort to keep her upright and walking. 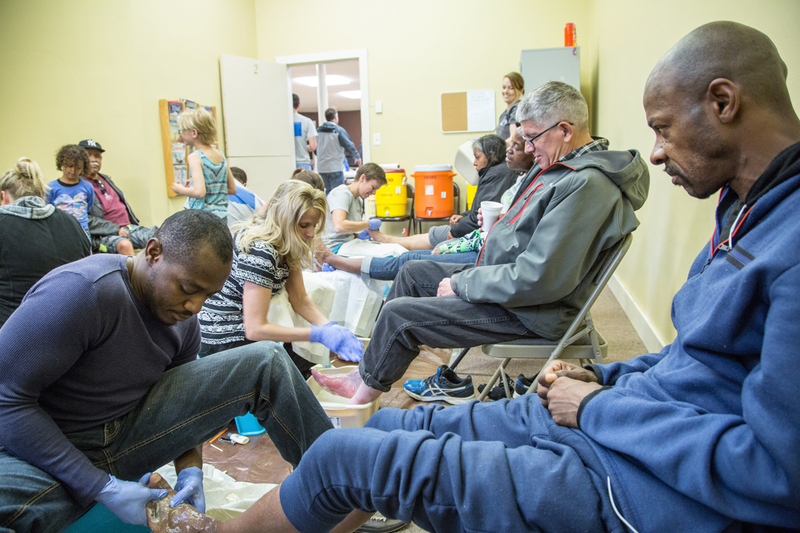 Frantz Alphonse, a student of MEDEX Tacoma Class 3, works on the feet of a female client at the Foot Clinic hosted by Urban Grace Church. 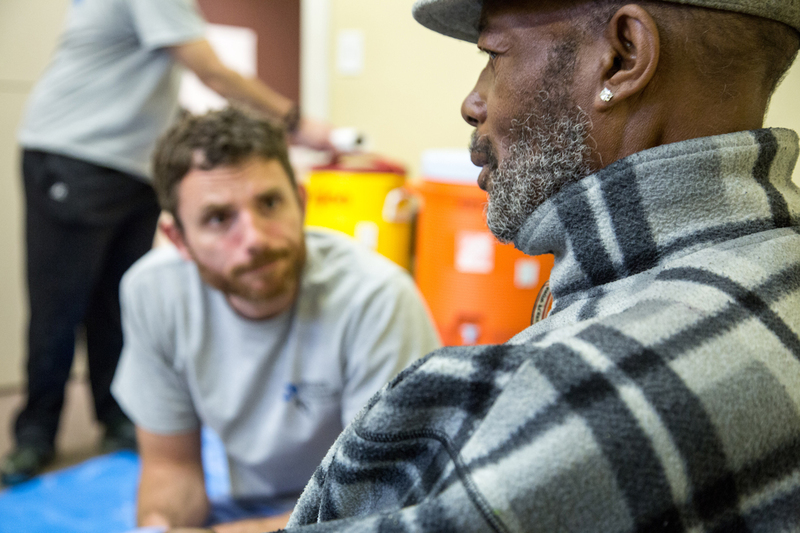 Mike Carter, PA-C, and founding member of the Tacoma Foot Clinic, listens intently to the story of a 63-year-old man who arrives presenting acute symptoms. The gentleman, who is homeless, has diabetes as well as severe bilateral lower extremity edema, which is cutting off blood supply to his feet and leading to gangrene of the toes. The client has open wounds on both of his feet which are not going to heal properly due to the amount of swelling and the underlying chronic medical conditions. 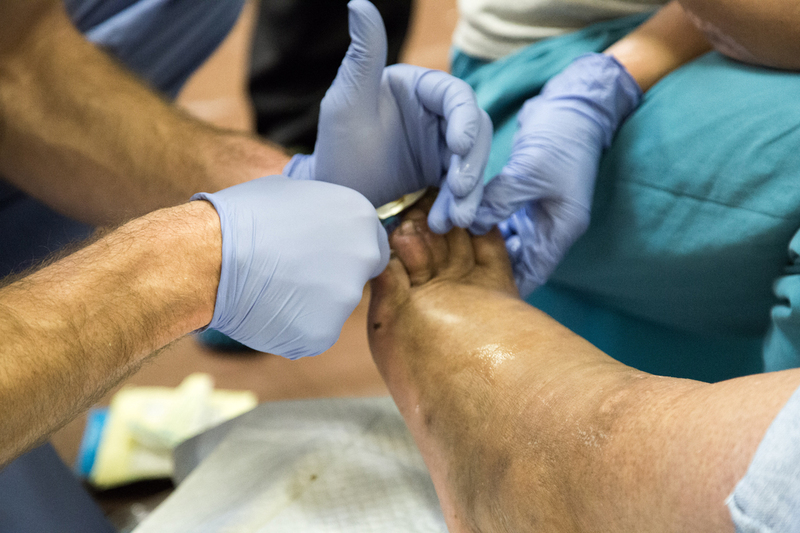 Mike Carter, PA-C, and Missy Griffith, a current physician assistant student at MEDEX Tacoma, do what they can to address the condition of the client's feet. The edema is evident in the client's hands as well. Mike Carter believes this indicates underlying heart failure and cardiac issues. Amanda Brown of Tacoma Class 3 talks about care options with the client. 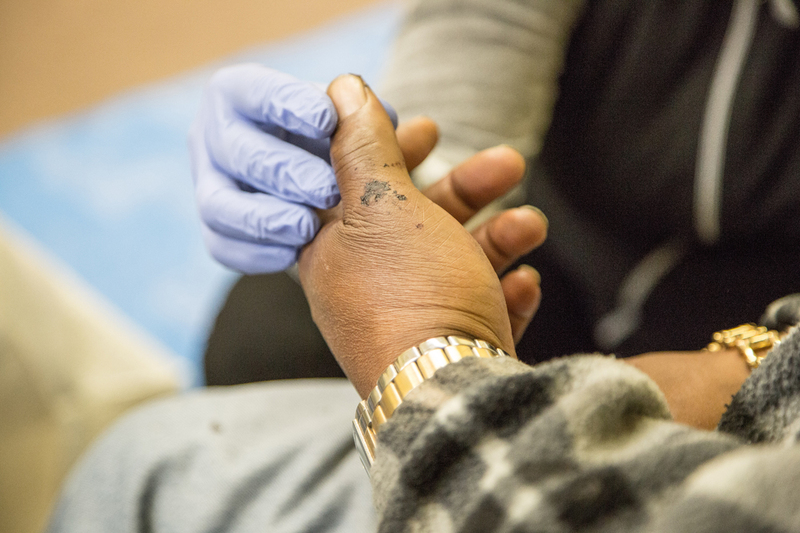 The hurdles to obtain proper medical treatment are seemingly insurmountable for someone on the street. The severity of this man's situation has caught the attention of many of the volunteers at the Foot Clinic.